The Crunch PX1000 Power Amplifier produces 1,000 watts when music and sounds blast through your auto speakers. Due to the fact that this unit is equipped with Quick Thermal Dispersion technology, it puts more aluminum on the heatsink than a normal amplifier to effectively distribute low sound waves. This professional car stereo sound accessory has multiple ports for different situations and various channel modes as well. When needed, the Crunch PX1000 can be relocated with ease since it only weighs 1 pound. Super fast delivery and great product. Wow , wow wow great seller, very fast shipping..
Tryed this brand again still not that good. received a day early opened both boxes no damage during shipping. reading over do(s) and don't(s) as a courtesy i noticed the recommended gauge wire to power the amp calls for 4 AUG yet the included a 8 AUG kit....? 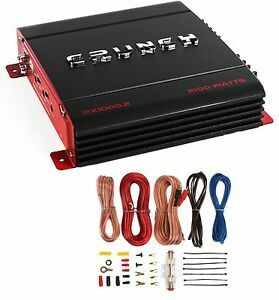 any way i wired it up to my rear door speakers they are mids so i have no issues other than i lucked out because if i was connecting to woofers they would have starved for power using a larger gauge than the recommended gauge by manufacturer. Amp gets HOT and go's off...but there's an easy fix...! Great little amp. if it didn't overheat...So i installed 4 (40mm) 12volt fans where two fans pull air and the other two push air thru the unit making the unit run much cooler. less then 10.00 to do this...Now i'm very happy with this crunch amp......she bangs like crazy...! I just hooked it up yesterday but it is working great so far. The attachment it came with to connect to the positive battery terminal was too small so I had to purchase a different one but otherwise everything it supplied worked great. This was already one of the cheapest amps I could find and the fact it came with the wiring kit makes it the best value I had seen. I got a set of dual subwoofers for free and wanted to be able to hook them up and this worked fabulously. The amp is small enough I simply attached it to the sub box and ran the cables into my trunk. The amp also shipped within a few hours of me placing my order and it arrived a few days early. So far I am very pleased. I installed with the suplied gauge wire (8) and it held back and hindered the amps potienchal. I bought s 4g wire kit nice true 4ga wire and wow what s difference amps not starving has lots of power now.. This amp is awesome but wire kit should be s 4g.